Big upgrade for Soulstorm, and no other. Contains all you need to upgrade your mod to the newest version, and with a big upgrade pack that makes the game load faster, better screen size options, removes the memory limit so you game don't crash on big mods ever again. It also improve graphics for the game. 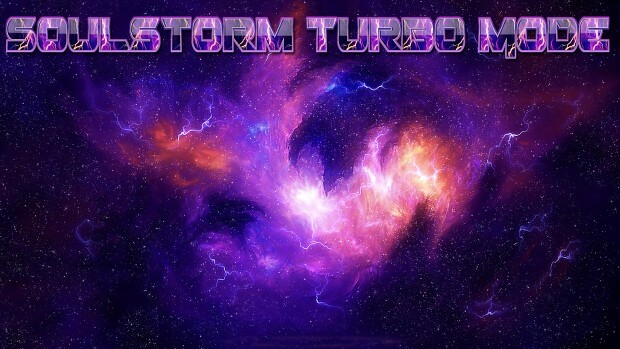 What is Soulstorm Turbo Mode? What is this, and what does it do? It will be a big boost to your game. It makes the game load much faster giving it the ability to use the memory unlimited. Before it was locked at 2 GB, which would make the game crash to desktop on big mods. It also Improves the game graphics to make it more high resolution, and improves the quality to make it more smooth to look at. It does not make the game skins HD. For that you need mods with HD skins. But if you use this the HD skins will look ten times better in the game. This makes the game require more to work. So, if you have an old toaster for a PC your game might crash. Fear not. In the file I will include a folder with the toaster settings. So you can still have faster and better Soulstorm without the improved graphics. Soulstorm Turbo was made for the DVD version, but works for steam too. I have had 32 people test this for me with no problems so far on both. So I know this works, But just in case take backups of any files before overwriting anything. First install the latest patches for the game or the whole game will crash. Yes, they are included in the files you lazy bum. With English,Spanish, German and Russian patches. You can find other languages here. There are two for each and you have to install both. It will tell you the correct order if you try to install in the wrong order. Then Copy the mod files to your Soulstorm directory (where it is installed). You need to extract the files there. I used 7zip, but other programs will work fine. Press yes to overwrite files, but make sure to create a backup copy of them just in case. Now you are done. Go to the improved file GraphicsConfig then go adjust the screensize to your game. It even let's you test it. Now you can start playing. Enjoy your "new" game. Does it work with UA LAA patch? Yes, but only if you install this mod first, then install the LAA patch. Not the other way around. If the Game crashes to desktop, then your pc was not strong enough to handle the improved graphics most likely. There will be a new folder called toaster. Copy the file in that one to you Soulstorm installation folder. Say yes to overwrite. Now your pc should work fine again. If not, good thing you had those backups. Right? RIGHT? Large Address Aware: This is a problem for some 32-bit versions of Windows. If you have 64 this does not apply to you. There is this webpage where a guy has a solution for you. He tells you here. How to get more boost to your game? Getting greedy, are we? well there are some fun tricks you can do yourself. You can't get much because you need to have relics tools to remake the game, but here is a way to do this. Thank's to Excogitatoris-Logica for this tutorial. Important note! : This requires at least 3 cpu cores to work. It will not make any improvements on systems with dual or single core cpu's. Make a shortcut to your game executable. Right click it and select Properties. "C:\Program Files\THQ\Dawn Of War - Soulstorm\Soulstorm.exe"
Click OK. That shortcut now launches a specific mod bypassing the intro movies, setting the Soulstorm executable on high system resource priority and set to not work on CPU core 1. As most applications load on the first core by default this core is busier and has less free cycles to run cpu intensive apps (such as DoW). By avoiding running DoW on the busier Core 1 altogether you can get a slight performance boost. - Right click your Soulstorm executable. On the Compatibility tab, select Windows XP SP3. Click Apply. This helps with performance and stability by a tiny bit. - If on Windows Vista/7 (8 unconfirmed), on that same Compatibility tab, check the "Disable desktop composition" checkbox. This will disable the transparency When Soulstorm is running and prevent it from freezing when alt-tabbing. Works partially on the latest Steam version update. I'm looking into it. -If running Windows Vista/7/8, run in compatibility mode for Windows XP SP2. and Thudmeizer Mod Team for testing, and support. Thank you all for helping me make this. is this compatible with unification mod?? It's not a mod, but an improvement to the game. It will affect all mods in that regard. Think of it as a high resolution patch with improved game performance. Using Steam version of Soulstorm. I have a GTX 1080, i5-6500, 16GB RAM. I can run the GraphicsConfig without any problem though. Did you install all the official patches? I just asked my steam testers. They say this happen when you don't have the newest patch. They are included in the pack. Just follow the instructions, and you will get it working. Install both patches. Maybe you have more luck downloading them yourself here. I have now made a steam specific version to help you out. It will be available for download on the SS turbo mode modsite. That means no need for the patches. where do I install the patch files? They have installers. Just go into patch folder, and select the one in your games language. I try to open it but I get a message that said that RAR can't open the file and it gives me 3 options...one said the file may be corrupted, the other said that the file may need a password..and the other that the archive may be incomplete...what can I do?? jONES1979 Gave the right answer. Sorry for late reply, but RL kept me a bit busy.